Purpose Many physicians recommend mastectomy in case of multifocal (MF) or multicentric (MC) breast cancer due to a theoretical risk of poor local control with less extensive surgery. We retrospectively evaluate outcome of patients with MF/MC cancers who had breast conservation with specific attention on local control and predictive factors of recurrence. 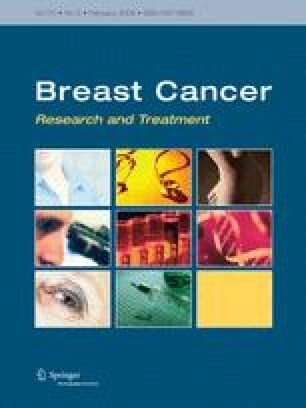 Patients and methods Four hundred and seventy six patients with either MF (n = 421) or MC (n = 55) breast cancer, underwent breast-conserving surgery between 1997 and 2002 in a single institution. Median follow up was 73 months (range 11–118). Results Median age was 53 years (range 23–86). Invasive lobular carcinoma was found in 88 patients (18.5%) and mixed ductal-lobular cancer in 27 (5.7%) patients. Two hundred and sixty-seven patients (76.7%) had two identified tumor foci, 55 patients (15.3%) had three and 29 patients (8.0%) had four or more. Two hundred and sixty-one patients (55.3%) had nodal involvement. The 5-year cumulative incidence of local relapse was 5.1%. At the multivariate analysis, over-expression of HER2/neu and lack of both estrogen and progesterone receptors (HR: 3.2, 95% C.I. 1.01–10.0, and HR: 2.7, 95% C.I. 1.06–7.7, respectively) were associated with a higher ipsilateral breast cancer reappearance rate. Involvement of four or more lymph nodes and lack of estrogen and progesterone receptors (HR: 2.7, 95% C.I. 1.06–6.7, and HR: 4.7, 95% C.I. 2.1–10.4, respectively) were associated with poorer overall survival. Conclusions In selected patients with MF/MC breast cancer, wide conservative surgery is not associated with poor local disease control and can be considered whenever acceptable cosmetic results can be achieved.